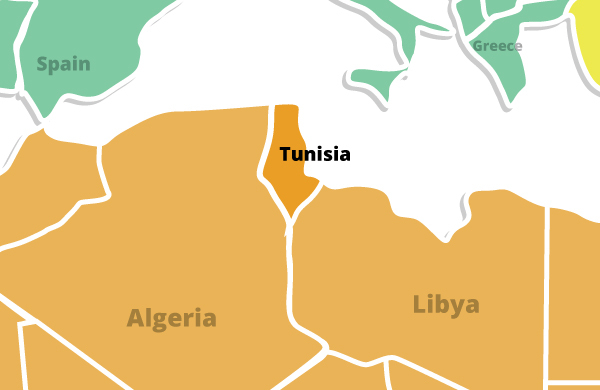 Tunisia's diverse, market-oriented economy has long been cited as a success story in Africa and the Middle East, but it faces an array of challenges during the country's ongoing political transition. Following an ill-fated experiment with socialist economic policies in the 1960s, Tunisia bolstered exports, foreign investment, and tourism, all of which have become central to the country's economy. Key exports now include textiles, food products, petroleum products and chemicals. Most Tunisian homes are built of stone, adobe, or concrete. In the capital, it is common to find luxury homes and modern apartment buildings. In urban areas, there are no front yards and very few windows. Most single-family homes are small and two or three stories high to make up for the small size of the foundation. The flat rooftops are commonly used as outdoor living space. In rural areas, many families live in gourbi. These are permanent tents set up for former herders.